Wednesday April 22 1908 I was out most of the forenoon showing Billy about the work. I went to town in the buggy about two oclock to take things in for the church supper and to see about a new hat. It began to rain on me so I hurried home. Will finished [illegible] before it began raining. Thursday April 23 1908 I was busy all forenoon with the work, prepared juice to make jelly, cooked crab apples. I cleaned the garret in afternoon. It was cloudy and raining some. I got through so I took a bath and put on clean clothes before supper. I wrote to Lydia in the evening. Friday April 24 1908 I did baking and got dinner over to go to town for my hat. It rained all the afernoon. I rested and made tatting. We heard today that Uncle John Woolf was dead. 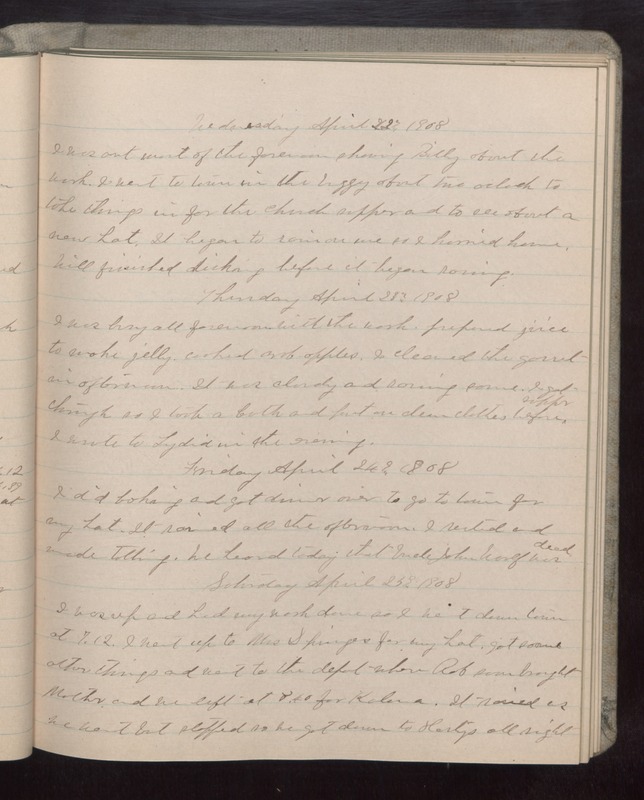 Saturday April 25 1908 I was up and had my work done so I went down town at 7.12. I went up to Mrs [Springers?] for my hat, got some other things and went to the depot when Rob soon brought Mother and we left at 8.40 for [Kalera?]. It rained as we went but stopped so we got down to Harty's all right.